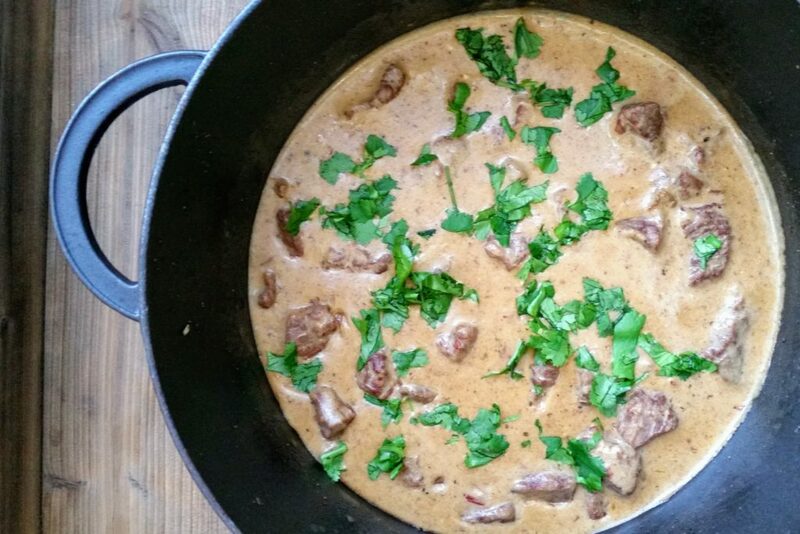 Beef Stroganoff was always one of my favorite meals as a kid. My mother made the best, in my opinion. Poppyseed sprinkled egg noodles, stroganoff, a side of buttered peas (also one of my favorites) and a sweet, fluffy, yeast roll. Can you just picture that retro plate? Don’t get me wrong, if that was on the menu at Mom’s house, I’d be over in hot minute, but I decided it was high time this delicious classic got an update. 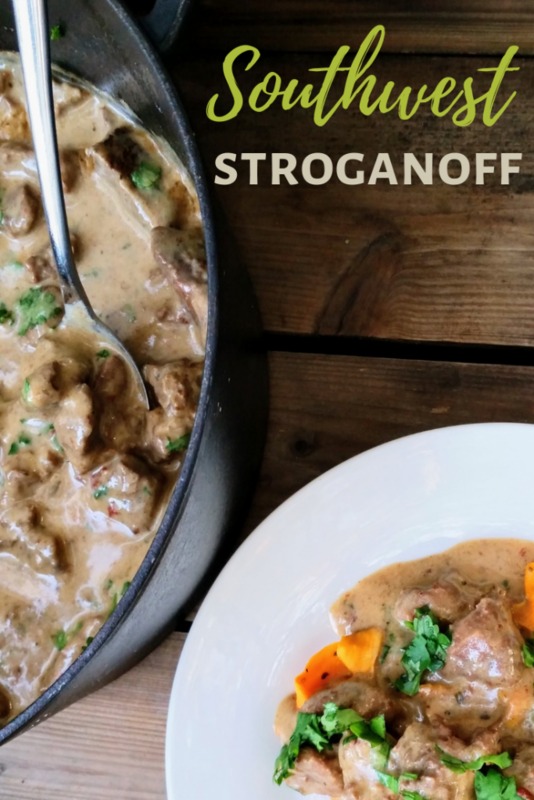 Stroganoff, by definition, is strips of beef cooked in a sour cream sauce. 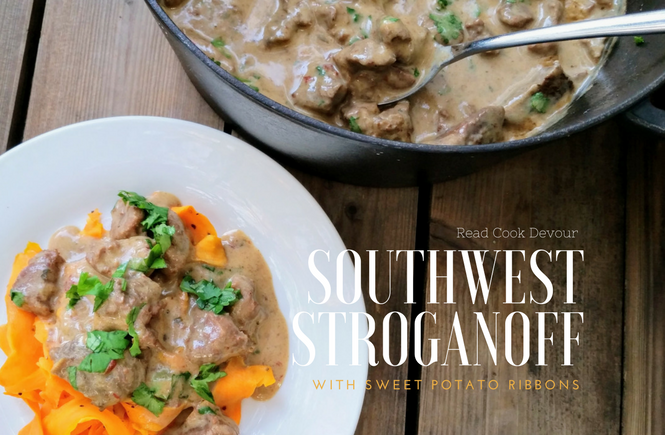 The essential goodness of what makes stroganoff such a well-loved classic has not been altered in this recipe. There is still beef and sour cream sauce. But this Southwest Stroganoff gets a whole new flavor profile from a delightful mix of Mexican spices. Instead of noodles, I opted to lighten things up with sweet potato ribbons. Briefly roasting the ribbons of potato in the oven, gives them a wonderful texture that is a perfect accompaniment to the rich sauce. I tried serving this over whole, baked sweet potatoes. Too mushy, not enough contrast in textures. I tried the spiralizer and then sauteed the spirals. Not right. But long, thin ribbons, perfectly roasted to al dente, is perfection. 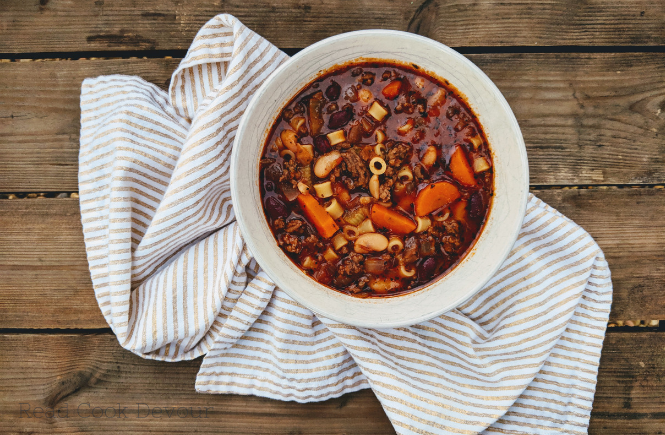 I hope you try this hearty meal, and enjoy something luxuriously rich and comforting without the extra carbs. 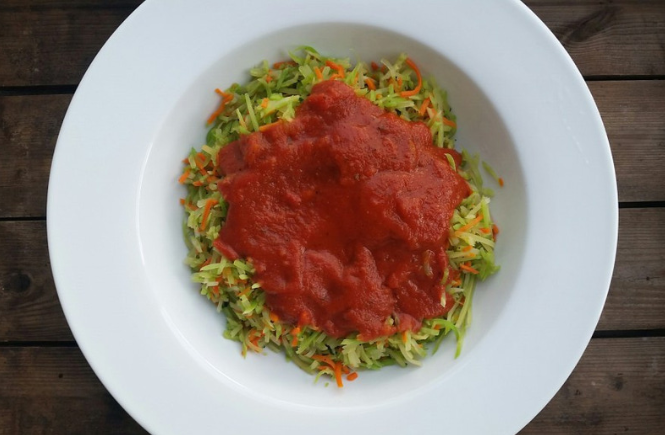 Pin this so you can add it to your dinner plan! A Southwest twist on an old classic! Cut beef into 1/2 inch cubes (bite-size). In a medium bowl mix together the 5 spices and salt. Add the diced beef and toss well to coat. 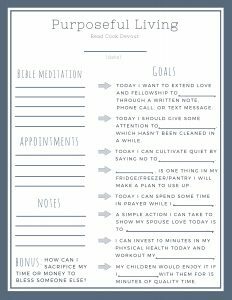 (This step can be done up to 24 hours in advance). Heat a dutch oven, rimmed skillet or cast iron pot with canola oil over high heat. Brown the beef in two batches. Dump half the meat into the hot pan and spread it out into one layer. Let it cook on one side for a minute or two and then stir it around to brown the other side. The meat does not have to be fully cooked at this point but you should see some great seared color (like a steak). If you are not seeing that, you may need to turn your heat up or put less meat in the pan (If you overcrowd the meat, it will steam and not sear). 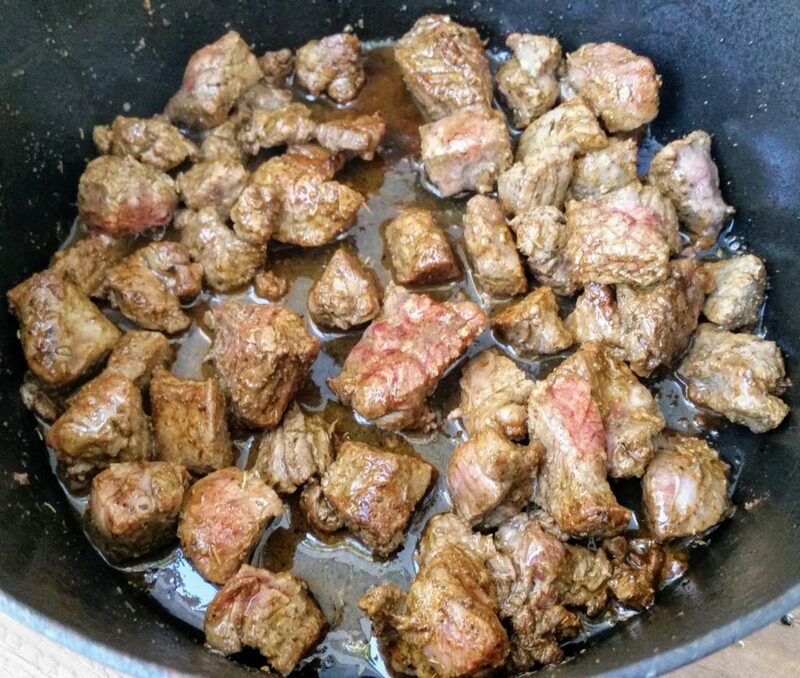 Move the first half of the cooked meat to a bowl and set aside while you cook the second half. Once cooked, re-add the first half to the second in the pot, and add the sliced onion. Stir to combine and cook for 3 minutes or until you see the onion starting to soften. Add the beef broth and minced chile and bring to a simmer. Cover and braise on low for one hour (*note* if you opted not to cut your meat as small as 1/2 inch pieces, then your cook time will have to increase). Check for tenderness. Meanwhile, peel and ribbon your sweet potatoes. After one hour, the meat should be tender. Ladle 1/4 cup of the beef broth into a measuring cup and whisk in the cornstarch. Slowly add the cornstarch mixture back to the meat and stir well. Cook for a few minutes until you see the sauce thicken. Add the sour cream and turn off the heat. Stir to combine and sprinkle with cilantro. 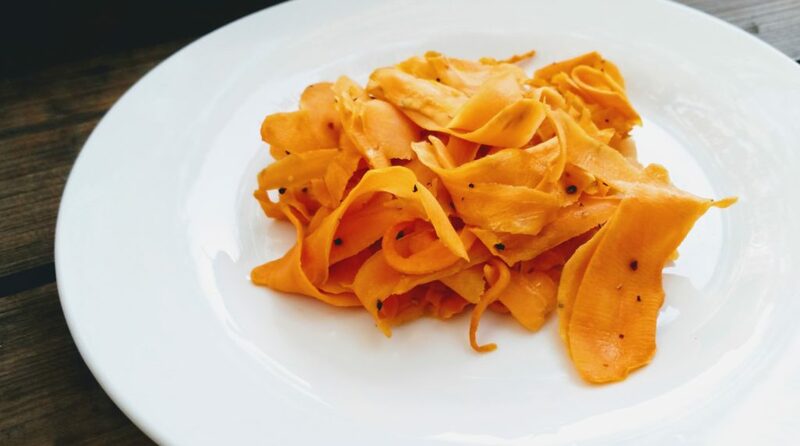 Serve over sweet potato ribbons. To make sweet potato ribbons, preheat oven to 400 degrees. Use a vegetable peeler to make long thin ribbons of sweet potato. 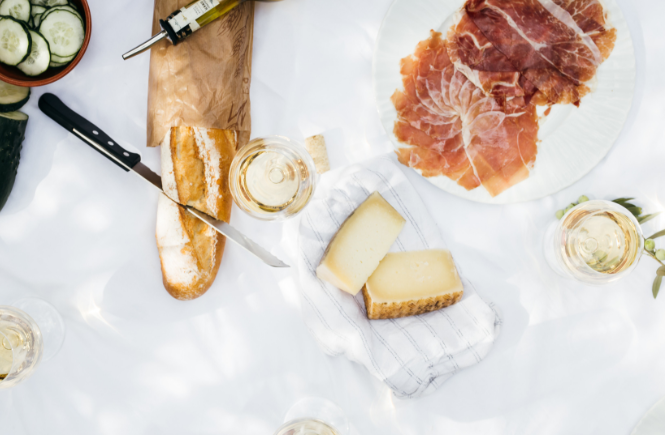 Add ribbons to a medium bowl and toss with 2 Tablespoons olive oil, a generous sprinkle of salt and pepper. Cover a baking sheet with parchment paper and spread the sweet potato ribbons into a thin layer. Roast for 10 minutes. Check for a soft but not soggy texture. You want them to have a little bit of chew to them still.